To buy the BLED112 dongle to use with LEGO WeDo 2.0, LEGO Boost or S2Bot software please click here. What is the BLED112 dongle? The Bluegiga BLED112 is a small BLE dongle that plugs into the USB port of your computer to add support for BLE (a.k.a. Bluetooth Smart / Bluetooth Low Energy / Bluetooth 4.0) communication. The BLED112 is unique in that it does NOT require any special bluetooth software/stack/support within the operating system, so will work quite happily on almost any computer, including many older systems that do not normally support BLE at all (e.g. Windows XP or 7). The BLED112 will work with Windows, Mac, Linux and Chromebook (as long as the software title such as S2Bot supports it). It is ideal for use in schools. Once again the BLED112 is NOT a conventional bluetooth adapter. 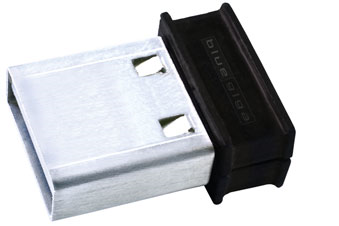 It is a ‘BLE to serial’ adapter dongle and creates a virtual COM port for communication. This is how it can work with older computer systems that do not support BLE by default. To use LEGO WeDo 2.0 or LEGO Boost with MIT Scratch 2 / S2Bot software on old or new computers (Windows XP, 7 8, 10, Linux, Chromebooks and any Intel Mac). To use LEGO WeDo 2.0 with the LEGO WeDo 2.0 software on older computers like Windows XP or Windows 7 (also works with Windows 8 and 10, but you must install the 'Windows 7' desktop version of LEGO's software (not the Windows 8 'app' version)). Note you must use this adapter with the 'Windows 7' version of LEGO's software - it is compulsory and the only supported adapter. It does not work with the LEGO software on Macs, this is due to the LEGO software, not due to the dongle. For general BLE microcontroller projects such as those using a PICAXE microcontroller, Raspberry Pi or Arduino. The following mail order companies sell the BLED112 BLE Dongle (as at Jan 2016). Expect to pay around £12/$15 for the dongle. On Mac, Linux and Chromebook no setup is required, simply insert the dongle into a free USB port on your computer. Note you can sometimes increase bluetooth range by mounting the dongle higher up – e.g. does your monitor have a USB hub you could use? On Windows 7, 8, 10 the driver will automatically download and install the very first time the dongle is inserted. On XP / Vista you can manually download the driver from this link. You MUST restart the computer after the driver is installed. It is strongly recommended to always use the dongle in the same USB port. As the BLED112 does not use any bluetooth driver/stack installed on the computer there is no need to separately ‘pair’ the bluetooth device within the operating system. This lack of pairing also makes the BLED112 simpler to use in schools. The actual BLE scanning/connection is all carried out via the controlling software 'behind the scenes' - so the software will generally just prompt you when a new BLE device is found and ask if you want to connect to it. Most devices can only be connected to one phone/tablet/computer at a time - so make sure the device is not also connected to your phone/tablet/iPad befor4 trying to use with the BLED112. Most software automatically identifies the BLED112 COM port, so make sure the BLED112 is inserted before starting the software. On Windows if you cannot see the Bluegigia device in Device Manager's ‘Ports’ section (e.g. it is shown in ‘Unknown Devices’ instead) the driver is not correctly installed and the BLED112 will NOT work.Right click over the entry and then reinstall this driver.